Peter - I think one of the major approaches would be to inject particle precursors into the atmosphere and I think most commonly, people think about things like SO2, like volcanoes would do, and then basically have aerosols forming, and those aerosols reflecting sunlight back to the space. Dave - So I guess Mt. Pinatubo was a big example of this. 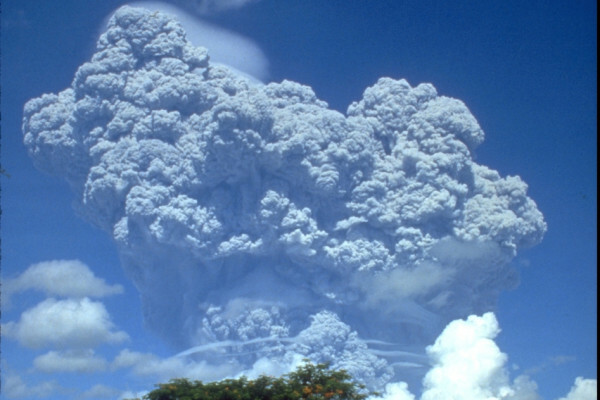 That was a big volcanic eruption which shot a load of dust really high up in the atmosphere and actually affected the climate. Peter - Yes, you're exactly right. So Mt. Pinatubo is one of our big case studies, so to speak. Basically the volcano went off and injected lots of SO2 into the atmosphere, aerosols were formed, and basically on these aerosols, we have then interesting reactions with the ozone. So ozone actually went down after Pinatubo erupted and then recovered afterwards, giving us a nice chemical tracer in the atmosphere. Also, obviously, it had repercussions on the heating rates in the atmosphere. So Pinatubo cooled, globally, the atmosphere, even though it caused something which is called winter warming. So actually, one of the winters after Pinatubo actually was slightly warmer on average in our latitudes and in our areas than it usually would be without the Pinatubo explosion. Dave - So is this because the dust is acting as an insulator, so if you're somewhere very warm, it's keeping heat out, but if you're in deep winter, it's going to keep some of the heat in? Peter - Yes, it's true. That's part of the thing as well, but as we've discussed today earlier, there will be changes in terms of the circulation and circulation patterns obviously have some kind of consequences for what kind of temperatures we have locally and for the local weather we experience in our region. And so, those circulation changes affect us in a way that we end up with a slightly warmer northern hemisphere. Dave - So, the circulation in the atmosphere is being driven by temperature differences. The equator is very, very warm so air is rising there and other places where it's cold the air is sinking. And if you affect the amount of light and therefore heat which is coming in to an area, you're going to affect the circulation with respect to that. Peter - That's exactly right and also, the vertical structure is very complicated. Where you have the aerosol locally high up in the atmosphere, at 15, 17 Kilometres, it actually causes local warming in the atmosphere. Whereas lower down towards the surface, where you have the aerosol scattering light back out of the atmosphere, you actually have local cooling. So you change the vertical structure of temperature and you also change the gradient from North to South, and that then acts as sort of a regulator on how the circulation will change. Dave - So, it's having effects all over this very, very complicated system. Dave - So, you're attempting to model some of these effects? Peter - That's exactly right. So we are running big climate models, at the Centre for Atmospheric Science in the Department of Chemistry at Cambridge University, together with the MET office, and it's basically one of the MET office models that we are using and developing together. And we are looking at what Mt. 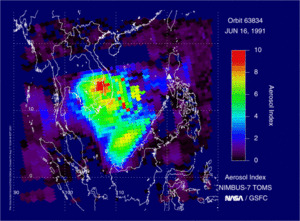 Pinatubo does to things like ozone circulation, climate at the surface. But also overall, what kind of large transport changes there are in the stratosphere, and how the aerosol has been vectored around and where the aerosol eventually left the atmosphere, and for how long it was around. Dave - So, I guess one thing you'd be really worried about, doing something like this deliberately, is if you're going to produce what would look like a minor side effect with respect to the whole globe, but with respect to the people living there, it could be absolutely disastrous. Peter - Exactly, I think that is always what could happen if you basically twiddle around with the climate system. You might get something right like global mean temperature, which obviously is the kind of metric that is important, but that doesn't really tell you anything about your livelihood locally and in any given country. And if you change the circulation such that a monsoon would fall in India then it would have very severe consequences for people there. Dave - So would you be able to tune how you're injecting your particles to reflect the light to possibly affect the weather relatively locally, so in some areas, you could increase the rainfall or decrease it? Peter - That might be possible but it is very, very complicated because bear in mind that basically, the circulation in the stratosphere which is the part of the atmosphere above 15 kilometres is very, very global. So it acts on slightly slower time scales than what we see in the troposphere in terms of circulation, but it's so global that basically, within months, aerosol is brought from the tropics to high latitudes. So whatever you do in the stratosphere, you have to think big. You have to think on the global scale and again, it might have repercussions then on a regional scale in the troposphere. Dave - Is this sort of thing ever likely to actually happen or do you think the legal effects and the general worry of actually something going horribly wrong would stop it? Peter - Personally, I think it's not very likely to happen. It's something that we need to study and will help us to understand how the atmosphere works, but as you say, there are so many legal issues, ethical issues, that I don't think we will do it in the end. Dave - But then again I guess, if the world was in a really, really bad state, due to global warming then the side effects might be less than the possible outcome of what's happening anyway. Peter - It might be. It's very, very hard to say and I think it's mportant that we talk about and think about those things. But I think we have to keep in mind, whatever you do there are winners and losers, and to regulate this in terms of some "global world citizen" view is, I think, an incredibly difficult thing to do.